Finnally I have found the time to mount all elements for the 4 new 25 el dg7ybn antennas. It takes some time to press and adjust 96 elements into the booms. Try to adjust to 0.1 mm tolerance equal on each side of the boom and it works good but time consuming. Put a dipole on the first one and tested and the measurements corrolates well to simulations and to the 4 yagis I built last year. The weather was not good today with a lot of rain the whole day making tuning difficult but managed to get a few measurements in between showers. Ordered a DEMI 70 cm transverter kit with an additional oscillator board for higher stability when connected to 10MHz reference. Hope it will arrive in the next few weeks and that customs consider the value to low to bother import tax and duty. It happens occationally that they don't care of some shippments from US. 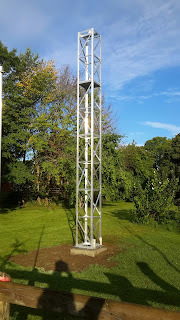 Will continue this week with the dipoles for the antennas and to finalize the rotator system. Final tuning of the antennas will be done when mounted in the system. Planning to use 1,4 meter RFC400 Cables from antenna feedpoint to a power divider of the typ 4 way λ/2 splitter thats 1730mm long. This corresponds to 5 λ/4 on each side making it possible to use short cables. The two Groups of 4 yagis will be combined with 4 meters of 1/2" LDF into a 2 to 1 divider. Will be some 0.35 dB loss in feeding cables but feels that the time to build and adjust a open wire feed is not there so its a subject of improvement for the future. Today I finalized the build of SM7EOI's 70cm. antennas and realized that the moon was on the way down. So up to the shack and switched on the 2m rig and fairly quickly detected I2FAK at -21 but elevation at that point was 21 degrees so no point in calling him as I do not have any elevation on 2m. Waited for the moon to go down but never heard him again. Had no MAP65 running so it was difficult to find any stations so I figured why not call CQ. 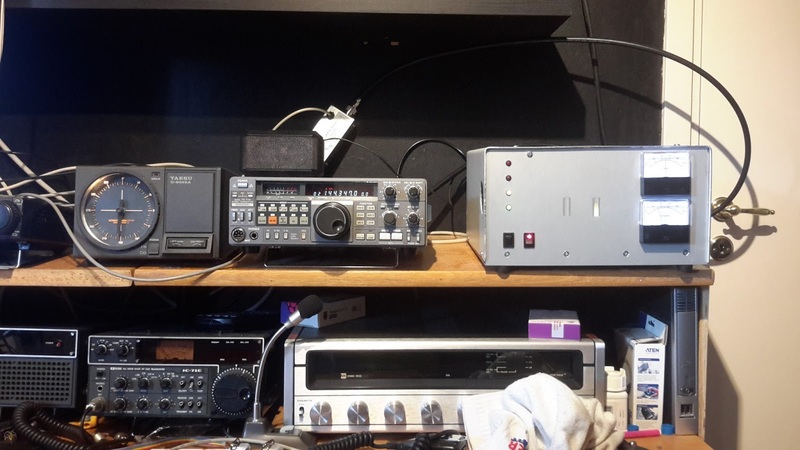 Got reply from HB9Q who also reported me on liveCQ at -24 and he was also -24 with my 11 element DG7YBN yagi ,10 m RFC400 and no preamp into the TS-711E. 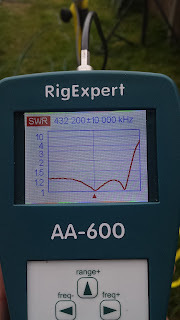 My output was 700W or so and the QSO was easy and ofcoarse without any deep search. Funny as HB9Q was my 1st on 70cm as well. To relax from building 25 element antennas I build 11 element antennas instead. 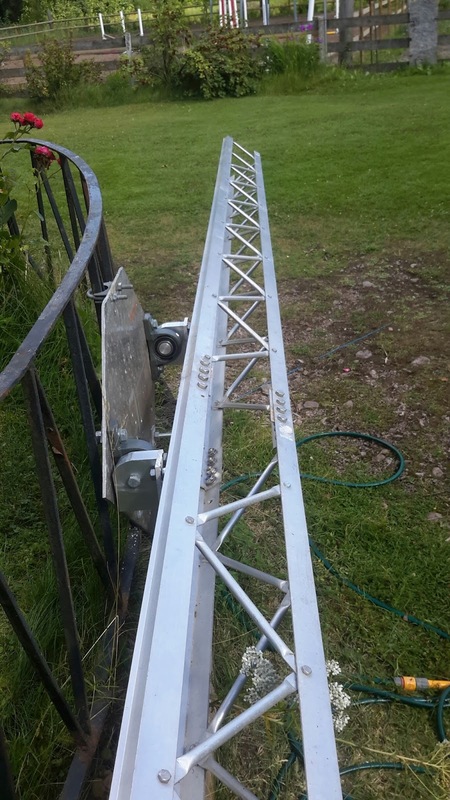 Building 4 of the DG7YBN GTV-11W to SM7EOI who is rebuilding his antenna setup. Uses the same concept as my 25 elements using 4mm element through the boom with plastic insulators. Where short of N bulkhead connectors for RG142 so I used semirigid 141 Cable instead. Compared to simulation the built antenna corrolates very well. 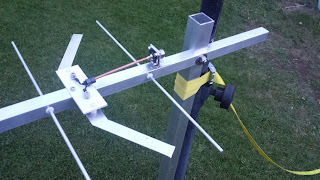 Dipole Construction and antenna mount. VSWR plot exactly as simulated. Spent the weekend working some ms on the Persides rock show. Ended up with 20 qso but nothing fancy but I lost my log when moved to this QTH so most is new anyway. My experience is that it was lower than i have seen before. Did hook up the homemade pa to the rig. Worked fine with some 600W output. Needs some final adjustment on power indicator and when the fan kicks in on rx. The fans is in operation during tx of coarse but higher temperature then a preset value it continues in rx Sequence to. This level seems to low. Use a HP brick PS but it was noisy at first so i needed to add some decoupling capacitors on the output side and I also put copper braided screens on output wires and grounded it in the PS case. 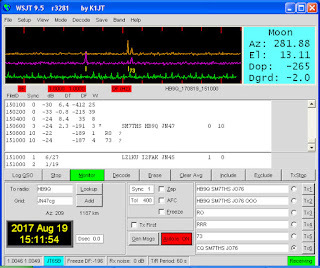 This solved the problem and the PS is now absolutely quiet from radiating any HF on VHF bands. The fans are not so quiet but I placed it on the floor behind the desk so not so alarming sound. 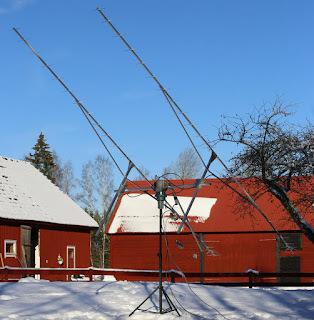 This blog is intended to show and describe my endeavor setting up, running and maintain a 70cm EME station. 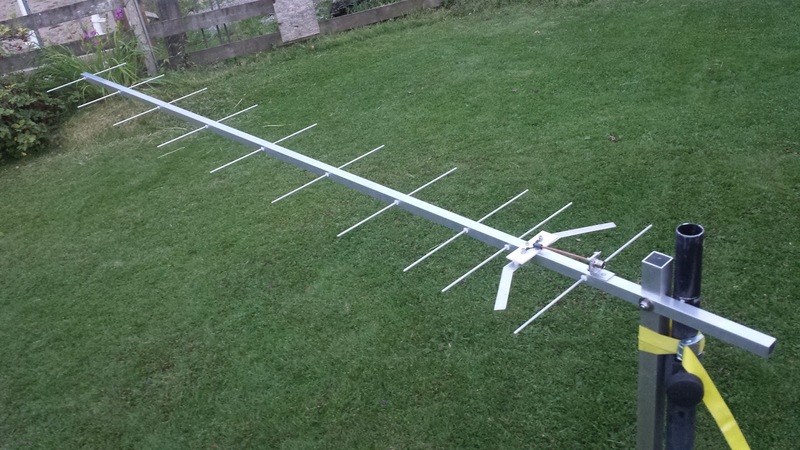 I started by choosing design of antennas and my choice is a 25 element yagi from DG7YBN great designs and building amplifier and LNA. 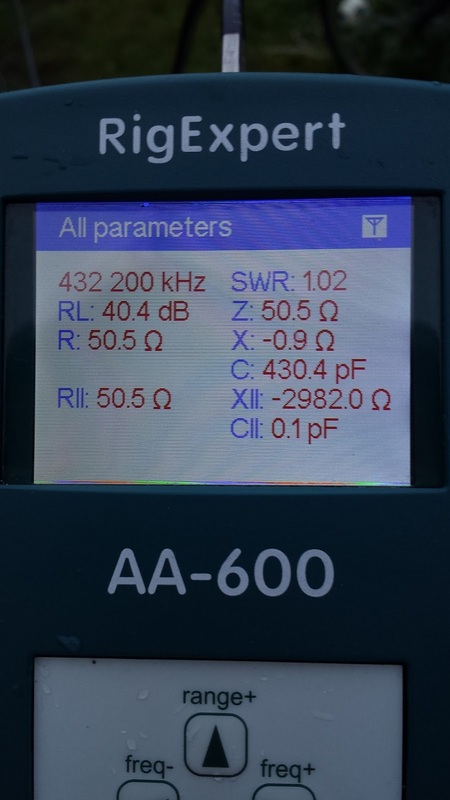 The reason for this choice is the length of close to 6 m which is an easy available length of aluminum in Sweden and simulations shows a very clean and nice pattern and a direct 50 Ohms feed without any coaxial impedance transformer. Like to build everything for my self and like the concept of isolated element through the boom so I went for 4 mm elements and plastic inserts from Theofils. Amplifier was a KW of W6PQL design and some kit parts was ordered and assembled during spring and summer and for LNA I have a stock of ATF54143 and like the YU1AW design where the input is grounded and tuned. Built 3 LNA's and the results are in the area of 0,34dB noise and 21dB gain which is fairly OK.
During summer 2016 I built 4 yagis and evaluated them and they behaves as simulated. Measured some low sun noise but it was later found caused by interference from a local 70cm beacon. Participated in the ARRL EME contest in 2016 using 2 of the DG7YBN yagis in both parts and managed 31 QSO in the contest and some 5 additional QSO's. The setup was very temporary using a small speaker tripod only 8 meters from the house. 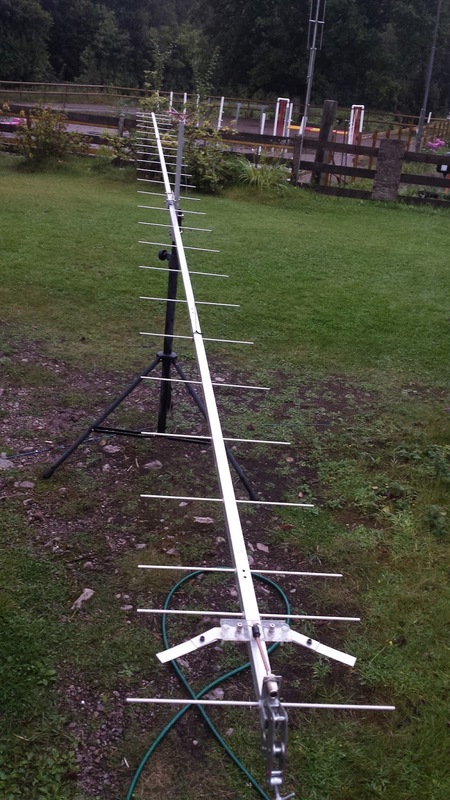 During the first part the weather was not good with high winds and a lot of rain detuning the antennas slightly. 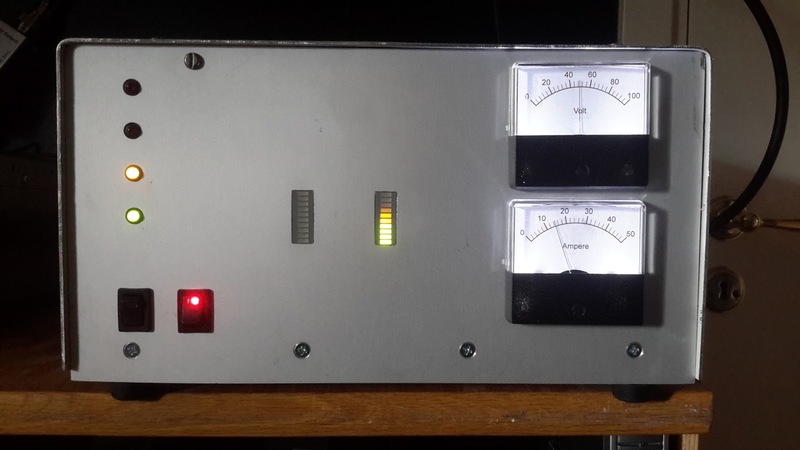 The first part I started using an IC706 but realized quite quickly it was useless as the frequency drift at TX was huge even though I used a temperature stabilizing circuit for the reference oscillator. Due to the drift at TX I could barely work HB9Q who was very strong and later after exchanging rig reported me on livecq as high as -9dB on JT. Changed rig to an TS811E after the first night which was more or less absolutely stable after some 1 hour warm up time. The first part I had no output power meter that could handle the power so I used some 400W or so to be safe. In the second part I tried to increase output power but encountered some problems with the amplifier and could not use more then 700W or so. 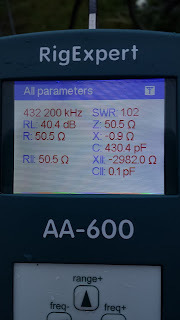 But the amplifier had no cover and the antenna was mounted only 10 meters away from the station and I had some problems with feedback which is not really that strange. Results was nevertheless very encouraging so I quickly decided to build 4 more antennas and use 8 of them, 4 wide and 2 high. 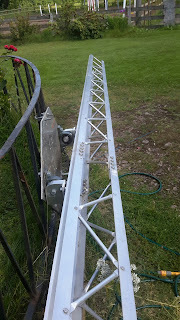 So this work is now on the way and everything is on track and the plan is to put the antennas up in less then a month from now. 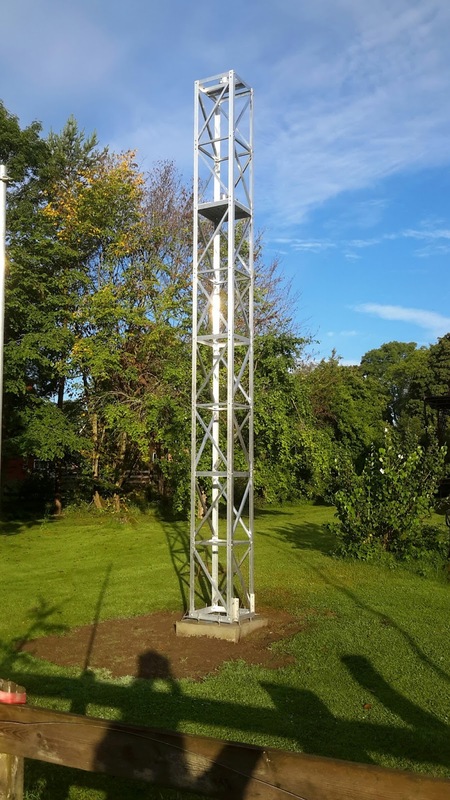 Started by designing and building a 6 meter mast and rotators planned to use is a big RAK from alfaspid for azimutand an actuator homebuilt solution for elevation. Horizontal boom for the antennas is a vårgårda mast with 200mm in side and 6m long. 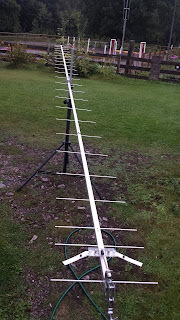 Stacking distance for these antennas are 1,8 m side by side so I will use 5,4m of the horizontal boom. All rotating will be controlled by a homebuilt interface based on the K3NG rotor interface. It includes a complete stand alone system with GPS receiver to correct for time and position and real-time moon and sun tracking. 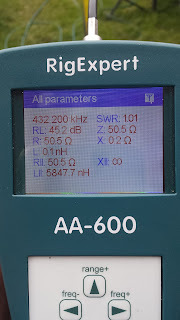 As I will use 4 antenna wide I need good resolution in azimuth direction and the RAK rotor only has 1 degree resolution so I modified it for a HH12 from DF1SR which is a 12 bit magnetic absolute encoder.